The Antikythera Shipwreck (circa 60 B.C.) is the richest ancient wreck ever discovered. Greek sponge divers located the wreck by chance close inshore of Antikythera Island in 1900. They spent a year salvaging its treasures, with the help of the Hellenic Navy. The divers recovered hundred of works of art including the fabulous bronze and marble statues that now fill galleries at the National Archaeological Museum in Athens. The wreck also relinquished a mysterious clockwork device, the Antikythera Mechanism. What does the wreck still hold? Locals on Antikythera tell tales of giant marble statues lying beyond the sponge divers’ reach. Records from the 1901 salvage indicate at least one large marble statue was dropped during recovery operations, and there are hints that others were dragged into deeper water under the mistaken belief they were just boulders. Meanwhile, ancient technology geeks like us wonder whether the site might be hiding another Antikythera mechanism, more pieces of the original, or at least some clues as to whom this mysterious object belonged to. Speculation abounds, because no scientific study has ever been conducted on the wreck. Only one officially sanctioned investigation has been allowed since the 1901 operation. Undersea explorer Jacques Cousteau and the Calypso crew worked at the site for several weeks in 1976, with the approval of the Ministry of Culture and under the supervision of Greek archaeologist Dr. Lazaros Kolonas. Cousteau knew where to dive, because he had previously visited the island in 1953, accompanied by MIT professor Harold “Doc” Edgerton. They dived for only three days in 1953, but saw enough to entice them back in 1976 to film a television show, Diving for Roman Plunder. The team dredged a section of the wreck to reveal more artifacts for the cameras. Since that expedition, no one has dived the wreck. Cue all-round excitement when in October 2012 our team of divers from the Woods Hole Oceanographic Institution and the Hellenic Ephorate of Underwater Antiquities went back for a proper look. The divers used James Bond-style closed circuit rebreathers and diver propulsion vehicles equipped, with high-resolution video cameras. In eight operational days, we circumnavigated the island at about 40 metres depth. At the wreck site, we found artifacts scattered over a wide area of the steep, rocky sea floor. These include intact pottery, the ship’s lead anchor and some puzzling bronze objects. The team believes that hundreds more items could be buried in the sediment nearby. The Hellenic Ministry of Culture and Sports has directed our team to continue investigation of the wreck. Beginning in September 2014 and continuing for one month, we will map the site precisely with an autonomous robot carrying stereocameras and sonar. Our specially trained technical diving teams will begin excavation of the wreck. Our mixed gas closed circuit rebreathers will give each diver more than 30 minutes of bottom time per day, far in excess of the dive durations of any previous efforts on the wreck. We will also deploy the Exosuit, a one-of-a-kind diving system made by Nuytco. Owned by JF White Contracting (a project sponsor), the Exosuit looks like something from science fiction: Ironman for underwater science. 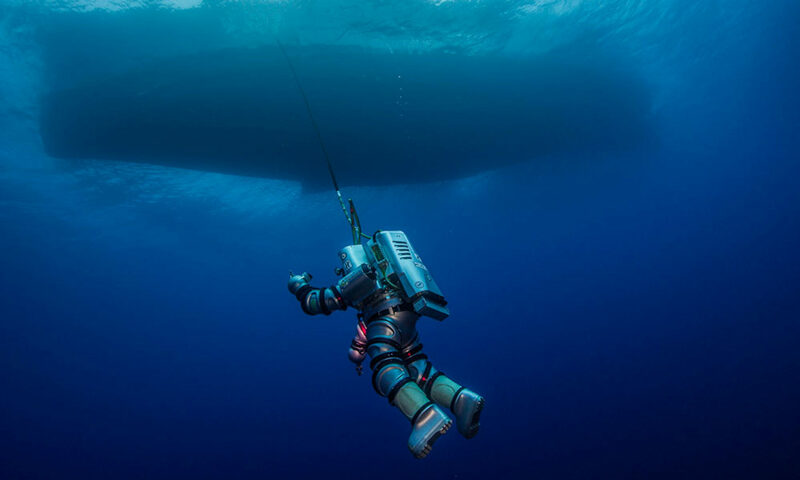 With Exosuit, our divers can safely descend to 1000 feet (300+ m) and stay for hours, without having to decompress on the way back to the surface. Aided by underwater metal detectors and an accurate site plan, we will assess the layout of the wreck and distribution of debris and material from it. We expect to locate and recover an assortment of artifacts. The recovery operations in 1901 and 1976 offer tantalizing proof of what remains: ceramic jars and galleyware, oil lamps, gold jewellery, silver and bronze coins, bronze statuettes, fine glass objects, remnants of the ship’s hull, elements of marble sculpture, and even human skeletal remains. Since the ship was transporting the highest quality of luxury goods, there is a very real possibility of unimaginable finds, similar in importance to the Mechanism.